Our apartment in 32312 Lübbecke, Am Markt 24, Anita Brandt, Gerhard Pollheide, currently in E-29752 Sayalonga (Spain), Phone 0034 628240771 or 0171 9309334 is as a holiday apartment or as an apartment for temporarily working in Lübbecke and the surrounding / vacationing people rent. Since we are still working in Spain in the next few years, especially during the spring and summer months, we have decided to stay in our apartment in times when we are not present, as a holiday home or as an apartment for temporary present in Lübbecke and the surrounding area To offer people. 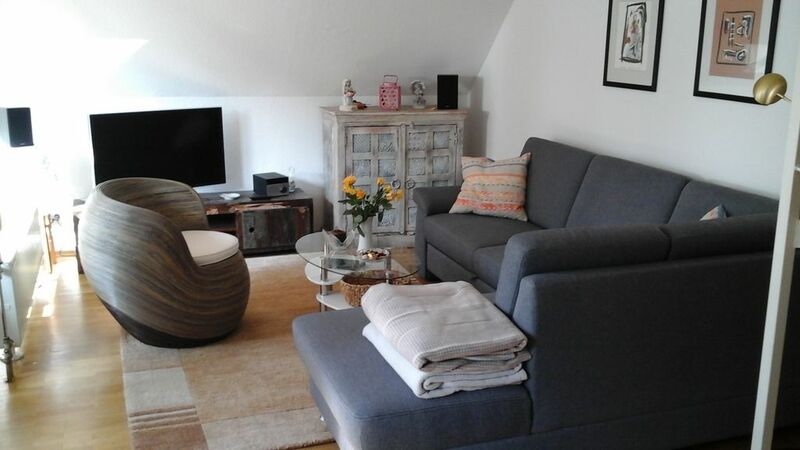 It is a 50 m² apartment with balcony directly in the center of Lübbecker. Parking is available around the apartment. We recommend the parking lot "Königsmühle". It is 100 meters away. There you can park for 2 € / day cheap. The apartment is completely refurbished to a high standard. All amenities are available, such as flat screen TV, CD player, radio, washing machine, iron, hair dryer, internet access via W-LAN (network key: HHYSHAVA), fully equipped kitchen, bathroom with shower, and storage and ancillary rooms. It is centrally heated. The hot water supply is via a water heater. It is located in the attic of the two-storey residential building. All shops, restaurants, supermarkets or pubs are within easy walking distance. The apartment is offered for 2 persons (+ maximum of one child) with a minimum rental period of 5 days. The apartment costs warm 75 € per day plus a one-off final cleaning of 75 € per rental. For stays over 4 weeks, special rates apply. Pets are not allowed. The apartment is a Non smoking apartment - and it should stay that way. Opportunity to smoke on the covered balcony next to the living room, where also an ashtray stands. In all other rooms smoking is not allowed. All spices, oils and other consumables in the kitchen can be used gladly. However, we ask you to replenish them according to consumption. We know ourselves that sometimes something can break (glasses, plates, cups z. B.). In this case, please get suitable replacement or deposit a reasonable amount for this. When leaving the apartment please always take the key, as the front door can only be opened hereby. Under no circumstances should you leave the key inside the door, as it will not open with a spare key when you lock it out. Please leave the apartment swept clean at the end of the rental period, if used, also switch off the heating and wash used dishes. For the waste disposal are in the southwest area of ​​the Burgmannshofes appropriate containers. For glass disposal, glass containers stand in front of the northern entrance to the parking garage. Upon departure, please drop the key in the mailbox with the inscription "Pollheide / Brandt". In case of loss of the key a compensation of 100 € has to be paid, since in this case new keys and locking cylinders have to be installed for the entire housing area of ​​the object. In case of emergency (but only in these cases) you can reach us on 0171 9309334. We also have three beautiful apartments in Spain in the mountains off the Costa del Sol. If interested, please enter in Google under search "Gerhard Pollheide". Then u. a. these apartments are displayed. We thank you and wish you a pleasant stay. If something should be missing, we ask for information by e-mail, so that we can remedy if necessary. Shower, toilet, window, sink, washing machine, toilet and everything else are available. Lübbecke is located in the Westphalian Mühlenkreis with many mills. The proximity to the Wiehengebirge and proximity to other cities invites you to excursions.